Sam Davies came off the bench to guide Ospreys to a comeback win over Clermont Auvergne that puts them top of Pool Two in the European Champions Cup. The replacement fly-half kicked 15 points after the break to put the Welsh region within touching distance of the quarter-finals. Clermont, who drop to second with one game left, looked in full control after a dominant first half put them 13-6 up. But the French side's grip loosened and Davies was faultless with the boot. 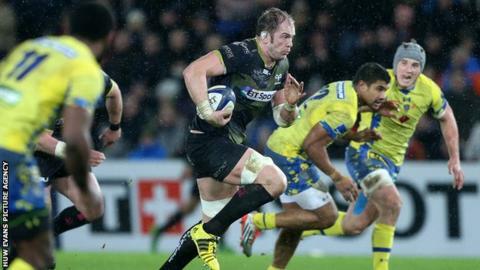 Clermont left without even a losing bonus-point, and Ospreys will now head to the final game at Exeter on 24 January with their destiny in their own hands as they seek to reach the last eight for the first time since the 2009-10 season. The match lacked the flair, verve and drama of the previous meeting in November, where Ospreys scored two tries in the final two minutes to secure two losing bonus points in an eight-try thriller. But the Welsh region displayed admirable grit - with captain Alun Wyn Jones leading by example and flanker Justin Tipuric again outstanding - and Davies showed maturity beyond his 22 years to steer them to victory. Wesley Fofana's try after six minutes set the tone for an enterprising first half for the visitors, who looked far more comfortable and threatening while building pressure through possession. They also won the forward battle with ease as the home pack found themselves on the back foot at almost every set-piece. Ospreys kept in touch through Dan Biggar's two penalties, with the second successful penalty awarded after a bizarre push by Clermont flanker Viktor Koleishvili on referee Wayne Barnes. The Georgian was fortunate to escape without seeing a card - yellow or red - but the indiscretion contributed to his sin-binning midway through the half after a tame scuffle with home lock Jones. Ospreys failed to capitalise, and even found themselves under more pressure, although Eli Walker wasted a clear try-scoring opportunity by kicking ahead rather than feeding the on-rushing Brendon Leonard. Clermont's dominance slowly began to evaporate after the break and the home side's confidence grew, despite losing Biggar to a dead leg. Davies proved to be a trusted replacement, and his two penalties and a drop-goal in a purple 10 minutes suddenly put the home side two points ahead going into the final 10 minutes. Clermont were rattled and jaded, and two further indiscretions allowed Davies to add another six points, with the last-minute penalty ensuring the French side returned home without even a losing bonus point. Ospreys coach Steve Tandy said: "I'm extremely proud of the players and I think they got what they deserved. "To come back from 13-6 down against a really experienced Clermont team was a real team effort. "We haven't got many glittering individuals as other European teams but we've got a massive team ethic and spirit." Ospreys: Dan Evans; Hanno Dirksen, Jonathan Spratt, Josh Matavesi, Eli Walker; Dan Biggar, Brendon Leonard; Paul James, Scott Baldwin, Aaron Jarvis, Lloyd Ashley, Alun Wyn Jones (capt), Sam Underhill , Justin Tipuric, James King. Replacements: Sam Parry, Nicky Smith, Ma'afu Fia, Rory Thornton, Dan Baker, Tom Habberfield, Sam Davies, Owen Watkin. Clermont Auvergne: Scott Spedding; David Strettle, Jonathan Davies, Wesley Fofana, Noa Nakaitaci; Camille Lopez, Morgan Parra; Raphael Chaume, Benjamin Kayser, Daniel, Kotze, Loic Jacquet, Sebastien Vahaamahina, Damien Chouley, Viktor Koleishvili, Fritz Lee. Replacements: John Ulugia, Vincent Debaty, Michael Simutoga, Paul Jedrasiak, Camille Gerondeau, Ludovic Radosavljevic, Brock James, Albert Vulivuli.